The SuperHero Program was founded by Dr. Gregory Damato after working intimately with thousands of clients over the past 15 years in the US, Australia and Costa Rica. He wanted a program whereby those who came would be utterly transformed on all four levels of wholeness: mentally, physically, emotionally and spiritually. Dr. Damato needed a potent program designed to rewire the neural pathways to break free of old conditioning and create a new internal vision of self. He needed to ensure all major organs were detoxed as well as the light crystal in the brain (pineal gland)as well as the blood to ensure the physical vessel which houses the soul was rewound back in time. He needed a way to unearth deep-seated emotional trauma and transform them into evolutionary growth potential via love and forgiveness. He needed a way to ground the spirit and activate the inner child through curiosity and our innate love of plants, deep jungle wildlife and pristine nature. The SuperHero Program was birthed because many of the people on the planet are suffering simply due to lack of knowledge, lack of self-love and unbridled emotional excess leading to addiction and an incessant need to escape. The true SuperHeroes of tomorrow are doing the deep work needed today to transform themselves and the planet one brave soul at a time. We offer 2 intimate SuperHero Deep Transformation Retreats twice a year, one in April and one in October on the Caribbean coast of Costa Rica. You may also choose a private 15 or 21-day individual, couples or family program if these dates don’t work for your schedule. Here is the info on what’s included in the private SuperHero programs. Please feel free to message us using the form below with any questions, concerns or to apply for a private Transformative SuperHero Program in Costa Rica. The creator of The SuperHero Program, Dr. Gregory Damato, PhD is a passionate spiritual warrior and has been rocking worlds for the past 12 years in Australia and Costa Rica with his unique zeal for holistic raw food living, detoxification, life purpose and symbiotic union of the mind, body, spirit and emotions in one of the most tumultuous times on the planet. Facilitating in the expansion of human consciousness via individual energetic medicine sessions, Skype consults, Super Hero Programs and Jungle Retreats in Costa Rica, Dr. Damato has been using his background in psychology, exercise science and research to alter the lives of thousands of individuals. 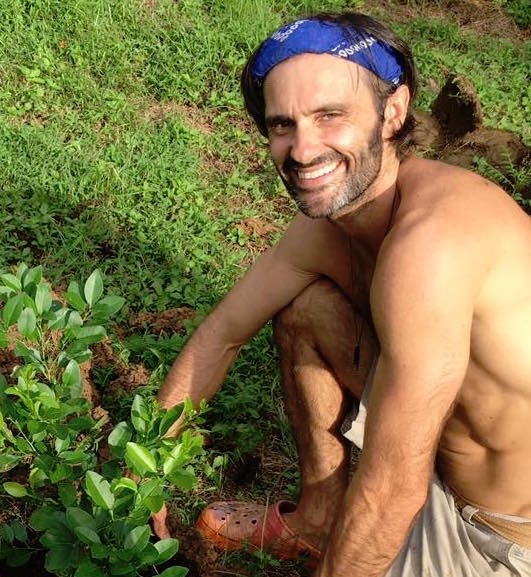 Living off the grid in his circular jungle home in Costa Rica with his beautiful wife and 4 conscious children, Dr. Damato writes cutting edge articles on wellness, consciousness, spirituality, living in natural magic, permaculture and finding one’s bliss. As the facilitator for your life-transformative program, Dr. Damato will ensure every aspect is taken care of as you shed layers and enhance your vibration back to self-love, inner peace and innate joy. A super conscious mama of 4 young super souls with a degree in massage and herbal medicine and a master chef of decadent raw food creations. A cultivator of consciousness, love, life-purpose and innate joy, Hillary knows the depths and continually pushes herself towards greater understanding of self and others. Hillary’s unique gift of self-empowerment through selfless love is evidenced in the countless souls that have been touched by her web of passion and internal bliss. Herbal medicine Goddess, body worker and shining light being, Hillary is the epitome of the divine feminine and understands that to first change the world we must change ourselves. Hillary enjoys nature from her off-the-grid circular home in a beautiful nature reserve in the jungles of Costa Rica with her husband and four children. In my early twenties I was fascinated by the world of emotions, my own repression and ways I could experience more freedom by learning proficient techniques and knowledge to release them, so I entered an amazing psycho-therapy program in 1992 and became a patient and trainee at the International Primal Training Center in Venice California. I started to practice yoga and instantly fell in love with the opening it created on so many levels, a now obvious connection from the body, to the mind and a direct connection to the spirit. In 1996 I enrolled at IPSB, the Institute of Psycho Spiritual Balancing and obtained a certification in different massage techniques, which I continued to enrich until this day, learning about a dozen modalities, another great tool to access the mind and spirit from the library of the body. After learning from different Hatha and Kriya yoga teachers and masters, I dove into the realm of teaching, my 1st class was held in Hawaii in ’96, instant gratification! It became obvious that health is not about a bag of piles that “seem” to resolve disconnected symptoms, but rather a holistic lifestyle capable of navigating between the body (“a true mirror of what is going on in my inner world”), the mind (“at service to the spirit”), and the spirit (directly linked to Earth sovereignty and joy). I delight in simply bringing people into nature for them to find their own and understand/integrate the 4 elements to become the quintessence, movement therapies to reconnect with their inner child’s spirit, white and red Tantra to get in touch with their own raw power and understand the anatomy of the spirit. We live in a world in which the basics of a healthy nutrition is not taught to us, on the contrary. In this time and age, it seems obvious that we individually need to learn how to be sovereign on this planet, finding simple and available sustenance like the breath which I call the medium to empower oneself. I look forward to going on the SuperHero path with you. Growing up in the Caribbean coast at the early age of ten, he began his first steps in the kitchen by helping out his grandma, who thought him some of the secrets of the delicious traditional dishes as well as the magic of herbs and spices used in their culture. Gio, after living in the city and many years of being a vegetarian, always in the search for new recipes, felt in his heart that it was time to return to the Caribbean coast where it all started, and share with others all that love he has for cooking. Mariela, a Costa Rican mom that has been practicing yoga for more than a decade. She first got her Nutritionist degree but then she fall in love with Yoga. She is a certified Yoga Instructor for Hatha Yoga, Children’s Yoga and Meditation, recently she also started studying the Iyengar method. She is a Reiki Master with the Usui System of Natural Healing. In 2016 she graduated as a Parapsychologist and Spiritual therapist at the International School of metaphysics and Spiritual science from Hungry, which is recognized by the European union. At the present time Mariela is dedicating her life to yoga and meditation teachings and therapies. Her classes are a combination of different yoga techniques with power, precision, alignment, pranayama, relaxation and meditation. As a yoga teacher and therapist her intention is to facilitate the yoga practice to every person who is going through the amazing challenge of self connection and are looking for inner peace and personal growth.